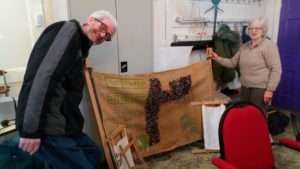 Here is a report from Elaine on today’s She Shed. It is to keep Graham entertained. 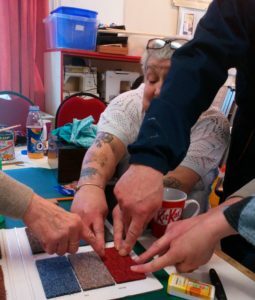 It was a unanimous decision on the colour of the carpet tiles – red will give the rest area some warmth and work well with the colour of the existing chairs. 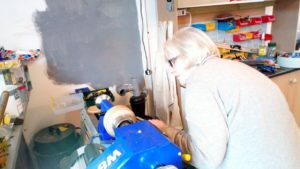 Betty also brought in an idea she’d had to make a lamp and needed to make a wooden base so off she went with the lathe! Paula was even more joyful than ever, finally finishing her table with Lance’s help. 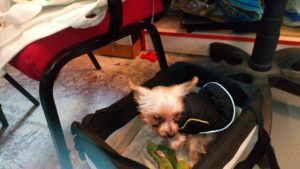 Her excitement was obvious although Pip was less than enthusiastic and stayed in his bed! 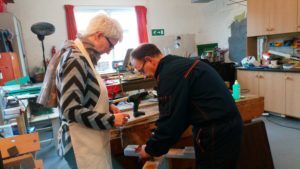 Linda tackled a future jewellery box with some lovely material and Brian sorted the wood out for the inserts inside it. 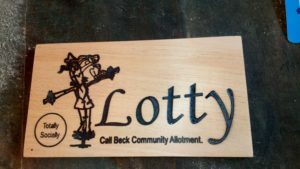 With Lance’s help, I finished the Lotty sign that will go on the shed door at the allotment. It just needs a coat of varnish and of course the shed to be erected. All happy, hope you had a good day too.